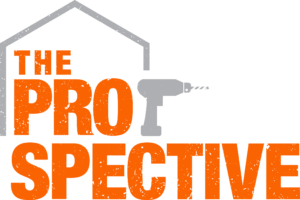 They say first impressions are everything and the same holds true for your home. 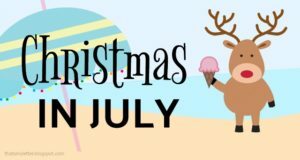 We’re dressing up the outdoors for Christmas today with a fun Holiday Porch blog hop organized by the very talented Taryn Whiteaker. 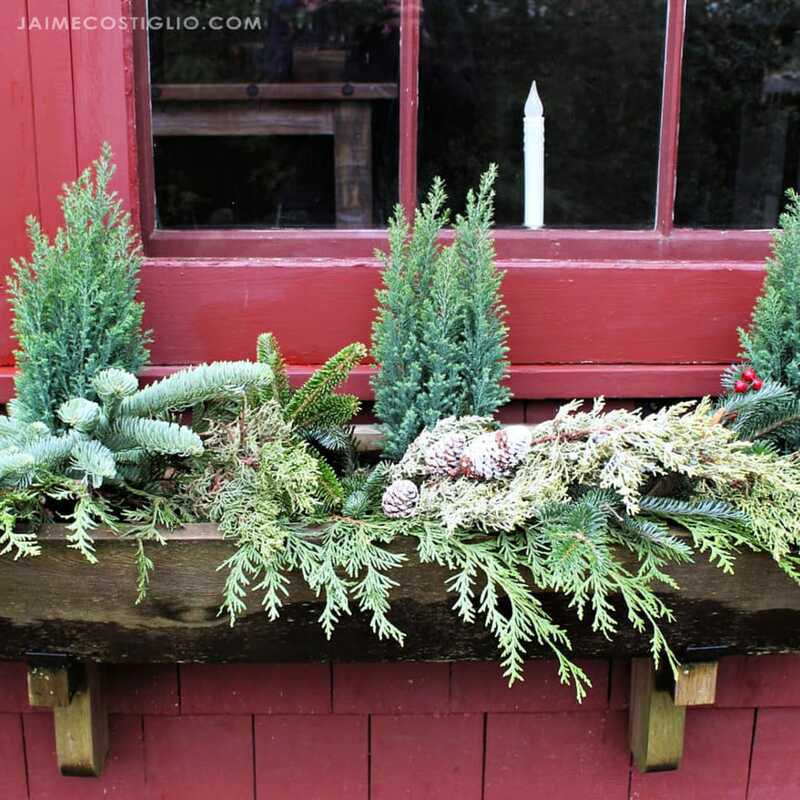 Make your exterior holiday ready with simple greenery. 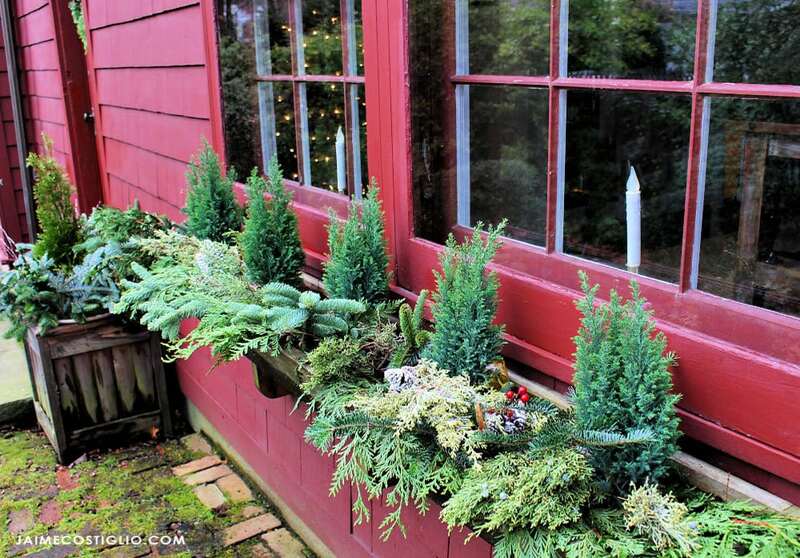 Sharing my outdoor Christmas decor along with 10 other inspirational holiday porches. About this time every year I’m secretly extremely happy that our home is painted red. 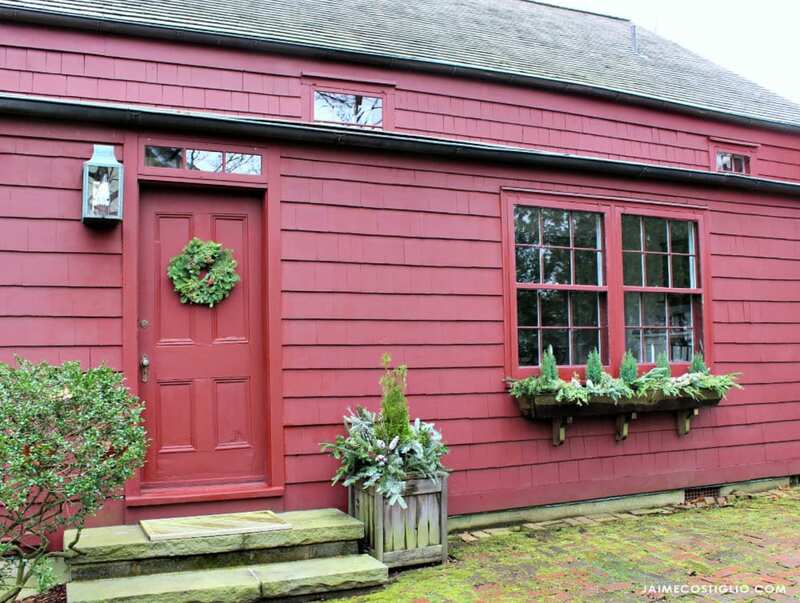 Benjamin Moore cottage red to be exact and yes it screams farmhouse but it’s also the perfect backdrop for Christmas. 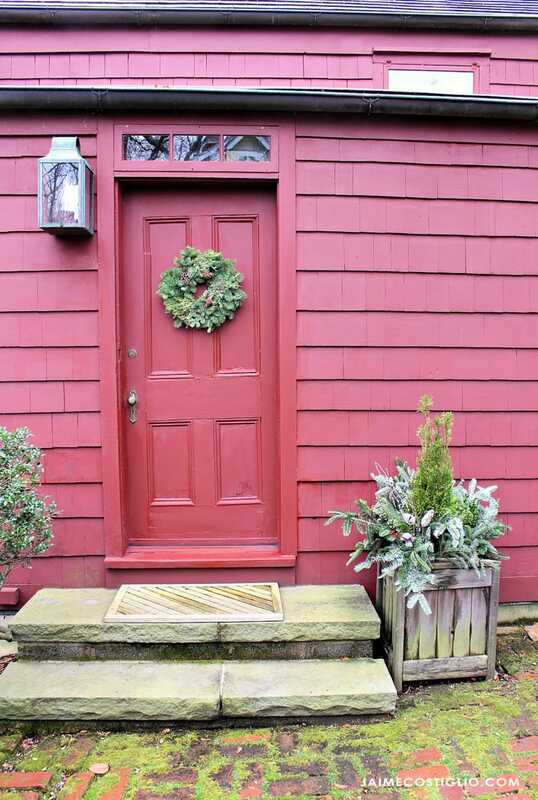 In keeping with the classic Christmas colors of red and green I added a bunch of live greenery to our side door and windowbox area just in time for the holidays. 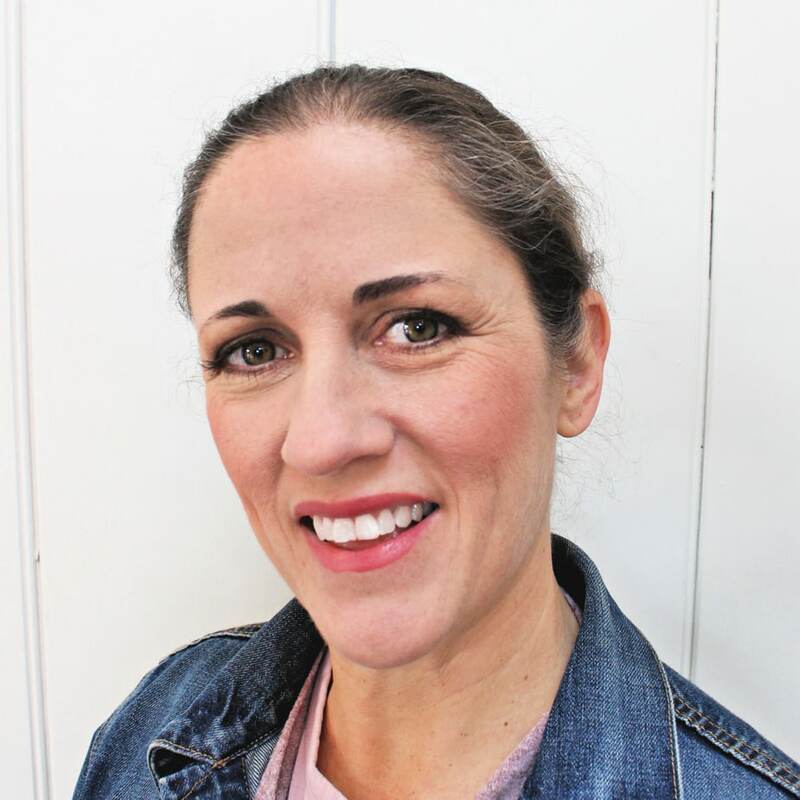 My number one tip when adding holiday greenery to your home is to BUY MORE THAN YOU THINK YOU NEED because you will definitely need more than you think. And greenery goes a long ways into winter so it can serve as your winter decor for a good while. 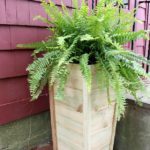 These mini Euro trees run about $5 each (Trader Joes and Whole Foods usually carry them) and are perfect for windowboxes or also great in cedar box centerpieces, super low maintenance and tons of texture. Add loose greens all around the base plus a few pinecone sticks and you are all set. Yes the door is not square or level but then again nothing is in our 1740 farmhouse so just go with it 🙂 It’s old and aged and I love it. 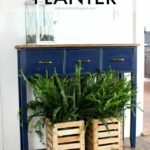 For your larger planters grab a potted evergreen then add loose greens all around the base. These potted trees should be fine until Spring when I can put them in the ground. 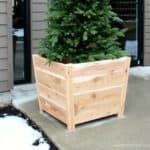 They also add height to an otherwise low planter. All we need now is a nice sugary coating of snow and it will be the icing on the outdoor decor. If we’re lucky it will snow before Christmas, if not there’s always January. 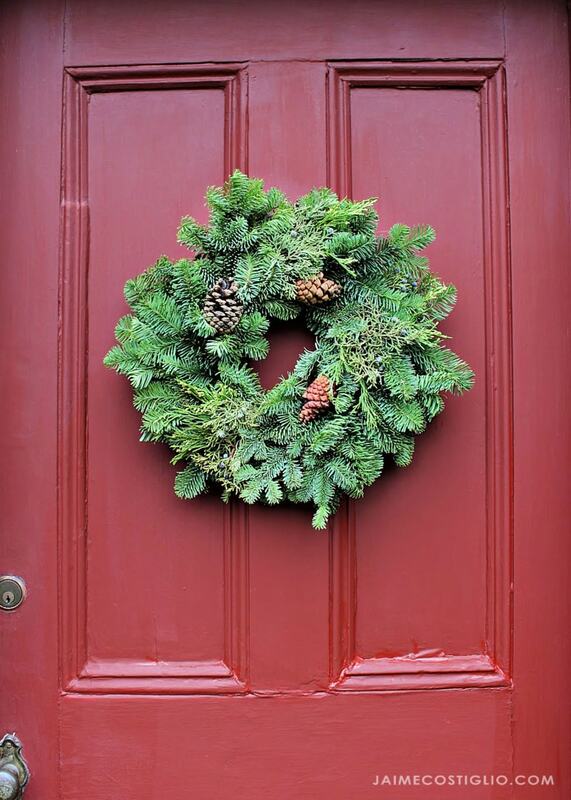 Please be sure to stop by each of these beautiful bloggers Christmas porches below. All of the decor is definitely doable and makes a wonderful first impression for your visitors. Ahh what a perfect house for Christmas! And the fresh greens are the perfect touch too! Thanks so much for sharing, Jaime! Your home is adorable!! And the window boxes are amazing! I love your red farmhouse. Very festive just by itself. Great tips for mixing greens and you can never buy too much greenery. Beautiful windowboxes. I hope you get some snow! That will be icing on the cake. This looks like a Christmas House! Oh, I love it! You must be everyone’s favorite at Christmastime! I’m pondering window boxes and your’s are just stunning! Thanks for all the sources! Merry Christmas! 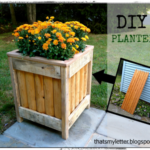 Thank you Yvonne, I hope the passersby enjoy 🙂 I only have the one windowbox but it definitely adds a boost of color / greenery to the space – I say go for it! Oh my goodness! Your house is just MADE for Christmas!!! The greenery looks so amazing against the red.